Dal Segno�s work has sometimes impressed me and sometimes not. In a head to head comparison I happened to prefer their reproduction of a Strauss roll over the work of rival company, Tacet. And yet Dal Segno�s are reproductions recorded in 1992 with ambient and action noise, both occasionally distracting. I must add that this disc definitely does them no favours. 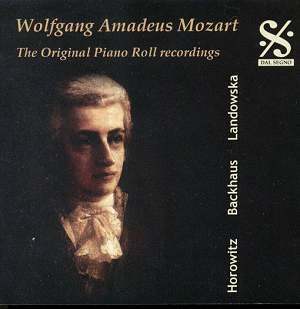 Thirty-nine minutes for a disc of this kind is hardly acceptable and there are, obviously, plenty more Mozart rolls in this wide world to be transferred. In their defence I should add that I�ve found all the previous discs I�ve reviewed well up to standard in respect of timings so this must be � I hope it will remain � an aberration. I can�t really summon up much enthusiasm for the roll performances either. De Pachmann left behind no Mozart discs so it might be at least partially instructive to listen to his Rondo alla turca, the ubiquitous encore standby from K331. But de Pachmann lacks vim and the roll seems to have dampened his ardour. Alexander Raab�s Fantasia is in part a casualty of the reproducing system in its lack of sensitivity of touch but does at least give a glimpse into the technique and musical style of a fine pianist. Whilst I�m grumbling about Dal Segno I should add that they give no biographies of any of the pianists but do provide a rather risible biography of Mozart. Where this leaves poor Raab, of whom only specialists will have heard, is anyone�s guess. He had a decent Central European reputation and made a distinguished career as a teacher in America. He did make rolls, though I�m not sure about discs. Landowska�s K576 hits the buffers in this roll. She recorded Mozart splendidly if inimitably on 78s but here the mechanical phrasing and uninflection renders this performance null and void. There�s no dialogue between hands and the system has flattened dynamics; all sense of lyric linearity � if there ever was any � has evaporated, not least in the vapidity of the slow movement. Little of this, doubtless, was Landowska�s doing. Backhaus pops up for two rather inconsequential minutes and then we have another of those Horowitzian pile-drivers, of which a number exist on roll. Very exciting doubtless but one must turn to disc for the real thing. Too many things are wrong with this disc; poor timing, essentially non-existent notes, inadequate programming, deficiencies of the roll system, and noise distractions that should have been dealt with.